The mission of the FIDPA is “Promote and implement the International Poker Rules worldwide as a way to protect the mutual interest & safety of the game and its players globally.” A poker world with one standard set of poker rules is a better poker world. The International Poker Rules are free available for non commercial use. For commercial use we offer casinos and poker rooms a licence with extra benefits for a small monthly contribution. The International Poker Rules are available in multiple languages! Your casino/cardroom can work with the International Poker Rules and so automaticly attrack worlds best players to your event. The International Poker Rules are made by an independent organization and more important, the rules are made by players and for players. Many international poker players gave their support to the International Poker Rules. the right of commercial use of “ The International Poker Rules English version,” Poker player will know what they can expect. This will result in a higher valuation for your poker venue. your website link and presence of your brand/logo on the internationalpokerrules.com website. the right to use The International Poker Rules™ logos in all your marketing expressions. automatic annual updates of the International Poker Rules including a briefing for your poker room staff. user friendly website of the International Poker Rules for all the poker questions of your customers. The International Poker Rules gives your staff ease, makes your customers more satisfied and your poker venue will safe money in spending time in setting up and renewing the rules on a yearly base. Just refer the players and the staff to the International Poker Rules. 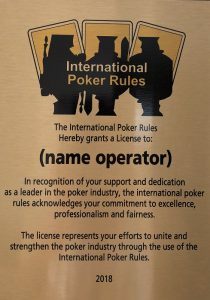 Please fill in this contact form to receive more information about a licence of the International Poker Rules. A member of the International Poker Rules Service team will respond to your email as soon as possible.